Choosing a mattress for your baby’s crib is an important decision. You will want to make sure you provide the highest level of comfort for your infant, since they will probably be spending over half of their time in bed! There are so many different styles and materials to choose from, that finding the perfect mattress can become a bit of a challenge. This review aims to help parents make the best choice, by showing the things you need to consider when shopping, followed by reviews of what we feel are some of the best crib mattresses on sale today. 0.1.1 What is the Best Mattress Material? 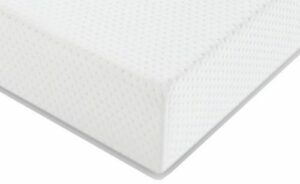 0.1.2 Firm or Soft Baby Mattress? 0.1.3 What are the Dimensions of a Typical Crib Mattress? 0.2 The Reviews: What Mattress is The Best Baby Mattress? In this crib mattress reviews there are a few things you should keep in mind when shopping for your baby. Below, you will find some of the things we think are important when choosing the perfect mattress for your crib. What is the Best Mattress Material? There are different mattress materials which may be used to make a mattress. Popular choices are fully foam – which is often the cheapest option – sprung, natural fiber or organic materials, including animal and plant materials. If your baby suffers from allergies, or there is a family history of asthma, it might be wise to choose a hypoallergenic material. It’s a good idea to look for a mattress which is waterproof, and also breathable. Some mattresses are also noiseless, particularly those without springs. This can help your wriggly baby have a better night’s sleep, without the noise of their tossing and turning wakening them (and mom and dad!) throughout the night. Firm or Soft Baby Mattress? Also think about how soft or firm the mattress is. It isn’t recommended to have a very soft mattress for a young baby, as this can become a suffocation hazard. However, many babies and young children won’t enjoy sleeping on a very firm or hard mattress. Something which is firm but not extra firm is ideal. Some mattresses are double-sided, with a softer side for babies and a firmer side for toddlers. These dual type of matress might be more expensive to buy originally, but should last longer, and will ensure your child is safe no matter how old they are. What are the Dimensions of a Typical Crib Mattress? The standard size for an infant’s mattress is 51 5/8″ long and 27 1/4″ wide. The thickness of the mattress is not recommended to exceed 6″. The mattress needs to be the correct size, to ensure there are no dangerous gaps between the sleeping surface and the sides of the crib. Standard crib sheets will fit mattresses of this size. Some cribs come in a bundle with a mattress which is great, as it will be the prefect fit as suggested by the manufacturer. However, sometimes mattresses which are included with cribs are not the highest quality. This has already been covered in the sections above, but in summary there are a few main safety points when buying a mattress for your baby to sleep on. It should fit the crib perfectly, with no gaps around the edges. It should also be no deeper than 6 inches, and should be reasonably firm to prevent suffocation. It’s best if the mattress is breathable in case your baby rolls onto their front whilst sleeping. The Reviews: What Mattress is The Best Baby Mattress? Below is a guide to finding the best crib mattress, you will find our reviews of different types of mattresses. We have chosen mattresses to fit all budgets, and made from different types of materials – there is something to suit everyone’s needs here. This foam mattress comes with a waterproof cover which can easily be wiped clean or zippered off for washing. It is made from a durable blend of foam, making it extremely comfortable for infants. The mattress fits cribs and toddler beds, and is 5.5″ deep. The hypoallergenic mattress is a breathable baby mattress which allows air to circulate, meaning your child will remain at a comfortable temperature through the night. The mattress comes neatly packed in a small box, so it needs to be left to air out and expand to its full size. This takes around a day or two, and the foam doesn’t have a smell after being aired. 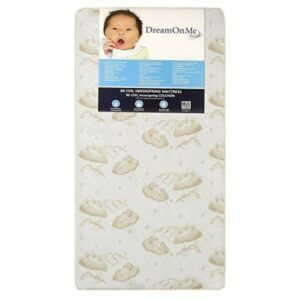 Overall this is a great, cheap foam mattress which will give your infant a great night’s sleep. This foam baby mattress comes in a choice of 3 colors, making it perfect for baby boys or girls. It is hypoallergenic, and fits standard sized cribs and toddler beds, meaning it will provide years of usage. The mattress is lightweight, but can comfortably and safely hold children weighing up to 50 pounds. The waterproof mattress does not have a removable cover but can easily be wiped clean – the outer layer of the mattress is vinyl. This also makes the mattress durable, perfect for growing children. The depth of the mattress is around 5.5″, meaning it gives the perfect level of support for young babies. This spring baby mattress is ideal for those on a budget. It features 80 spring coils – it’s firm and provides an excellent level of support. There is also wire around the entire perimeter of the mattress, to keep the edges and corners firm and in shape. 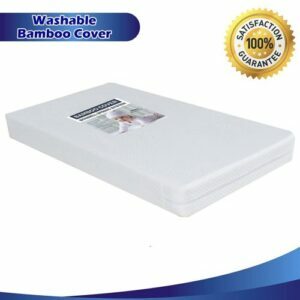 The infant mattress comes with a waterproof cover, which is also breathable and hypoallergenic. This ensures your baby will have a sound and comfortable night’s sleep, night after night. The cover can easily be wiped with mild soapy water, and it is also reversible allowing parents to choose between two different designs. The mattress also comes with an excellent 10 year guarantee, protecting against defects in the materials. This dual mattress features a firmer side for infants and a softer side for older toddlers. 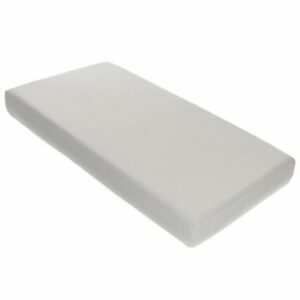 It is made from supportive memory foam, and comes with a pure cotton cover. This is waterproof and washable, making it really convenient for new parents. The cover perfectly fits the mattress meaning it won’t get bunched up as your baby wriggles around during the night. The 2 in 1 crib mattress fits standard cribs and toddler beds, meaning one mattress will last for years. The mattress can be safely turned to the toddler side once baby can roll over and control their head movements. The reversible baby mattress comes at a great price and will offer your child many years of comfort. This organic mattress is extremely breathable, making it perfect for babies who are prone to sleeping on their stomachs or face-down. The mattress consists 90% of air, meaning babies can breathe right through the mattress! There is a removable cover which is highly absorbent and can be both machine washed and tumble dried. The mattress itself can be spot cleaned, and if you want to give it a good freshen-up, the whole thing can be soaked in the tub! 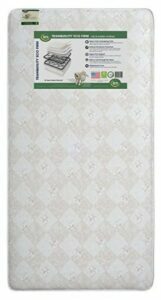 This top-rated organic crib mattress can be used by infants as well as toddlers. It is firm and breathable enough to make it safe for newborns, yet also supportive and comfortable enough for older toddlers to enjoy. This makes it well worth the high price tag – it will last for years, and because it can be fully washed it can also be used by subsequent children. The natural mattress contains no foam, latex or springs and is 100% recyclable at the end of its life. This makes it a great choice for parents who are concerned about their impact on the environment. This Graco newborn mattress is made from comfortable, supportive foam to guarantee your baby has a good night’s sleep. It is 5 inches deep, which is the perfect balance between comfort and safety. The mattress comes in a small box, so needs around 3 days to fully expand to normal size. Therefore, purchase in advance before the mattress will be needed. 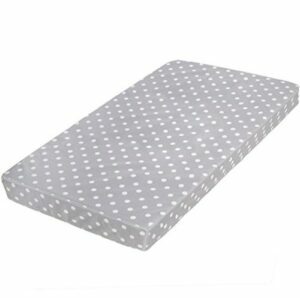 The newborn mattress has small holes on the surface, ensuring it is breathable. It’s also water-resistant and comes with a removable cover for easy washing in the early weeks when accidents are inevitable. The foam mattress is anti-microbial, to help infants from getting any infections. This organic baby mattress features a washable bamboo cover for optimum comfort. The mattress is waterproof and breathable, and the cover is made from hypoallergenic materials making it perfect for babies who may suffer from allergies. The mattress is also stain-resistant meaning it will continue looking great for years to come. The firm mattress features almost 150 steel coils, giving a great level of support for growing babies. There is also wiring around the edges to prevent the mattress from sagging after a while. This is the largest mattress which will fit into a standard sized crib – making it very safe as there will be no gaps around the edge of the mattress. It is 5.5″ deep, making it supportive and comfortable without being too deep. 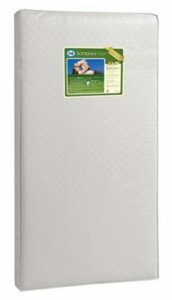 This Sealy baby mattress has a hypoallergenic soybean core, for outstanding comfort and safety. 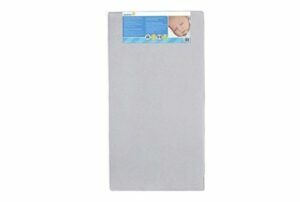 It is extra firm, giving a great level of support to newborns and toddlers, yet also lightweight. This is the best Sealy mattress if you are looking for something long-lasting – it won’t sag or dip even when used by toddlers. The certified foam filling is made in the USA, making it great for parents who are concerned about their environmental footprint. The baby breathable mattress has pockets to allow air to flow through, keeping the mattress fresh even after years of use. The outer layer of the mattress is waterproof, meaning you won’t have to buy any other protective covers. The mattress can therefore be quickly and easily wiped clean in the even of any accidents or spillages, saving new parents time and effort. This Serta mattress is double sided, meaning it can be flipped over as your child grows. The infant side is firmer for safety, whilst on the toddler side there is an extra layer of natural cotton. The mattress has 120 coils for excellent support and comfort. There are also air vents inside the mattress to keep it fresh, ensuring it won’t contribute to any respiratory problems. The Serta organic mattress is made in the USA and contains certified flexible foam. The cover of the mattress is made from a waterproof vinyl material, which resists water and stains. The dimensions of the mattress are 52″ x 27.5″ x 6″, and it features squared corners to ensure it fits perfectly inside a crib. 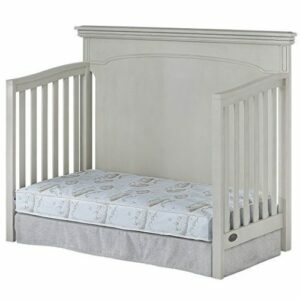 This is great for safety, as it ensures there are no small spaces around the sides of the crib. 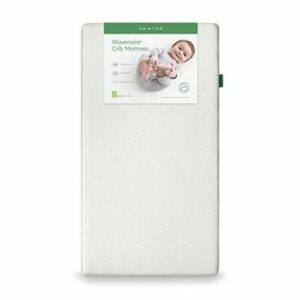 The organic baby mattress by Newton is an excellent choice for any new parent looking for the very best sleeping arrangement for their infant. It is one of the top mattresses available on the market today, and also one of the safest. Whilst it is one of the most expensive choice, it will last for years and can be handed down to future children. This, and the excellent safety it offers, makes the Newton mattress an excellent choice overall. We think the best inexpensive mattress is Milliard’s double sided offering. This is the best infant mattress for parents on a budget – it offers all the main features of a more expensive product, and has the advantage of being double sided. Babies will be safe and supported, whilst toddlers will be comfortable on the memory foam layer. It also comes with a waterproof and machine washable cover, making it excellent for busy new parents.